NEW TO JESUS AND THE BIBLE? If you are new to Jesus and the Bible and wish to learn more about God’s plan for you, please contact us or visit us. We would be honored to partner with you in your journey. Please leave a name, number, and reason for your message and you will be contacted as soon as possible. Pray that if God is real, he will show you by opening your heart and mind to whatever he has to show you. Read an easy to understand translation of the book of John from the Bible. You can easily read most translations in app form by downloading the Bible app for iPhone or Android. We have also found biblegateway’s clean interface and many translations to be of great help to us. Read in a translation that is easy to understand. 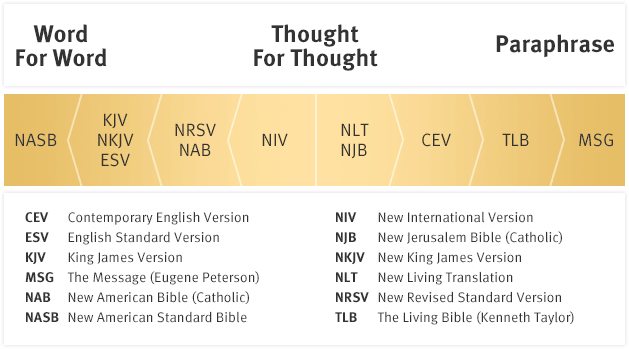 For a plain language easier translation, we recommend you try the NLT. We use this version in our church for its ease of language. Below is a chart showing which versions are easiest to follow. 3. Visit a local, Bible-believing church and tell the pastor about your journey and your needs. Most churches maintain a website where you can learn a lot about them. A quick google search can yield fast results. View their sermons online to see if their style might resonate with your learning needs. If you want assistance in finding a Bible-believing church, we can help. Please fill out the church placement survey and we will see what churches near you will fit your individual needs. At ABF, our heart is to educate the masses. We specifically feel called to the sincere believers in Christ in the local churches who have become disenfranchised from their local bodies, from the Scriptures, and from doctrine. Our resources are crafted to reground these Satellites to the gravity of God’s revelation and truth. To this end, we have developed several surveys meant to better inform us how to accomplish this task. Please take the time to fill out the appropriate survey below and (if asked for) someone will contact you shortly with ways that we can partner in your journey toward God. Education Survey: This survey will help us to understand where people are at educationally, where they want to be, and how they digest information. Church Placement Survey: This survey will help us to understand what an individual might be looking for in their church experience. We realize that God makes different churches just as he makes different parts. Not every church fits every person. It is a primary goal of ours to find that right fit by connecting you to the right church. The more vulnerable you are with us, the better we can understand how to place you in a church that you resonate with. A main aspect of being a church is helping the community that the church is in. If you are someone who needs help that we can give, we would love to help. Please fill out the intake form below so that we can see what we can do for you. After this is done, someone will contact you shortly. ABF Services Intake Survey: A way for ABF to assess whether we can help you. Please fill it out and someone will get back to you shortly. We are always in need of Church Partnership, Prayer, Introducing people to the Vigilance Radio Network and Financial Support. Please visit our contact page for how to get ahold of us or fill out the appropriate survey below. People looking for churches need a good home where they can be integrated, supported and be safe. Please have an official representative of your church fill out the form and a member of our ministry will contact them as soon as possible to continue the process to partnership in our ministry. Church Partnership Survey: A way for churches to connect with ABF and partner with them in placement of those looking for a home church. Our network includes many topics and shows ranging from pop culture to sermons. To better explain how these things are connected and where someone might access this content, we have created a simple flyer that you can hand out at Bible studies, church events, youth groups or any other things that make sense.